Today, former executive editor John Wayne Ferguson (aka The Duke) will be flying to St. Petersburg, Florida as a Poynter Institute college fellow. He'll be learning the ropes of journalism in a two week "journalism boot camp" along with other top college journalists in the country, making us proud, of course. This week, along with the others at the end of the school year, marks the end of an era. John made tons of changes to the paper, as he recorded here on Mub 156, integrating our paper with the community more than ever. And more than John - saying goodbye to Joe, Kyle, and Jake will be sad. I'm still having a tough time imagining sports without Joe's fiery rants and spontaneous high-fives. As a news editor this year, it was interesting seeing the transformation John's passion for the paper had on us all. I think there was quite a bit of a "piggyback effect" - at least, I know that when I came back from break, many of us wanted to make a difference in the way the paper ran. When the group that went to San Diego came back, they had a vision of what our paper could be, and plenty of ideas to implement. I have to admit, I was a bit taken aback by the increase in responsibility that came with being content editor. I'm glad I got to give the position a test drive this spring, so I know what to expect in the fall. Seriously, though - when you get at least 50 emails a day, it does get difficult to keep up. 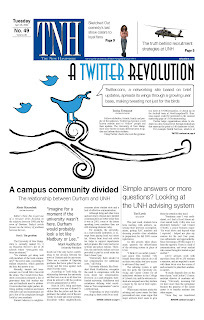 And I'm already looking for story ideas for next year - email me at tnh.news@unh.edu if you have any! As we all leave for the summer or go off into the world in search of our next calling, I have to give a shout out of love to the organization we call The New Hampshire. It really is the people that make it all worthwhile. The late nights don't seem so bad when you have a good time with the others around you. I've never seen anybody else get so worked up over body text (yep, Meredith - I didn't forget), front page layout design (Nate has offered to give certain stunning front pages a date, if you can believe that), hockey (complete with beard-betting contests), and random photo/multimedia shots of the newsroom (Meg and John - you never know when they'll be watching!). And shout out to Tori Lewis, because, as Meg says, she's probably the only one who's not a nerd and chooses to work with us in the newsroom. Ah, a special group, indeed. Can't wait to see what next year brings, with new Executive Editor Cam Kittle at the helm. Until then, we have a fabulous summer to enjoy. Now that we've got the numbers done in the big picture sense, it's time to recognize the writers who have done the most work for TNH since September 2008. First a caveat, TNH does not believe that quantity necessarily means quality. However, we were blessed this year to have both dedicated and talented young journalists contribute to the paper throughout the year and they should all be commended for their hard work. Two notes on these final counts. First, when they were hired, staff writers were told they only had to write one article a week. Editors were not required to write anything. Second, our sports staff is prolific and possibly did more work than the numbers indicate. But the reason that we discount them from the last byline count is because they got many bylines by virtue of writing a game story. Call it an asterisk, if you will. Good job everybody and thanks for all the hard work. If you picked up our year in review section last Friday, you may have noticed the little breakdown of just how much content TNH has produced over the year. But just to reiterate, here's our year, by the numbers. TNH has produced 52 issues since Sep. 12, 2008. The '08/'09 staff was also responsible for producing freshman issue for orientation week, the dining guide for Family Weekend, the special Election Day pullout, the Year in Review, and the (soon-to-be-published) Summer Issue '09. Over 150 people have contributed to the production (writing, editing, or photography) of TNH since September. The list we give SAFC only has the two dozen names of our paid staffers, but we would be nothing without our hundreds of contributers. From journalism students who had to contribute an article for their class, to freshmen looking for a place to fit in, to upperclassmen that were just interested in trying their hand at journalism; our contributers make TNH of the most highly-participated organizations at UNH. Over 740 articles were written by TNH writers since September. That's an average of over 14 bylines an issue. TNH's editors paginated over 1,100 newspaper pages over the last year. I'd like to make a quick point about those last two statistics. One of the criticisms we often receive is that we run too many Associated Press or UWire articles in the paper. Going back through some issues that year, there were some that were really heavy with out-of-house content. However, it's my belief that one of our job's at the paper is to teach aspects of journalism that are not taught in the UNH journalism program. One of those things is the use of programs like InDesign, Photoshop and Illustrator. During the time our news editors are preparing those 14 articles to be fit for copy and layout, our paginators built their skills by putting together wire pages. I'll take the increase in skills (and a couple extra pages of news) over having people sit around in the office complaining there's "nothing to do" any day. Last night, the UNH English Department held its annual student awards and scholarship ceremony, and a handful of TNH staff members were recognized for their academic and writing success. Former Managing Editor Kyle Stucker received the Laura Rice Journalism Award for excellence in writing and reporting. Executive Editor Cameron Kittle and Content Editor Keeley Smith both received the Michael Kelley Memorial Scholarship for excellence in journalism. Staff Writer Brittney Murray received the Theodore "Tad" Ackman Journalism Scholarship for excellence in the English/Journalism major. Staff Writer Shawn Cyr received the John Hanlon Memorial Scholarship for excellence in journalism (sports writing). We'd like to congratulate our colleagues on their awards and thank them for sharing the skills and dedication they show in the classroom with our publication. Sometimes I get an idea in my head, and it won't go away until I get it out on paper. 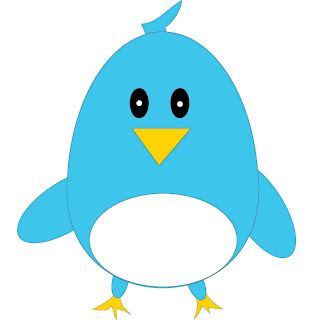 Unfortunately, one idea I had this week was "How else could we have done that Twitter front". You don't get do-overs in the paper, but if you have free time, you can redesign an old page and try to using it as a teaching moment. Here's what ran on Tuesday. And here's a version that I think would have been more effective (the layout would be the same below the fold). 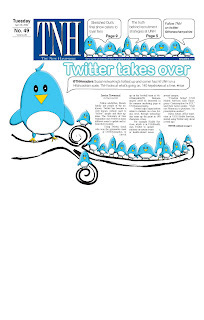 The story's about a lot of people joining Twitter, so I went with putting a lot of birds on the front. I drew the birds in Illustrator, based off some sketches I had done in a notebook and some inspiration from others people's Twitter Bird designs (there are a lot out there). All of the birds are the exact same drawing, I just stretched, squeezed and flipped them to make them all a little different. I also bevel and embossed them, because I like that effect. I made the lead hed as close to the twitter font as I could (it's just a rounded off Arial). I also was able to make the news deck exactly 140 characters, the amount Twitter allows you to include in one post. But, like I said, you don't get do-overs and that first page looked fine. But sometimes, it's good to go back and think about how something could have been done differently. That way, the next time a design opportuniy like this arises, you know how to do something that works, rather than something you're not entirely happy with.